Hawaii became a state August 21, 1959, the 50th state admitted to the Union. The Harbor was first entered by Europeans in 1778; it was declared capital of the kingdom by King Kamehameha III in 1850. Long the main residence of the Hawaiian royal family, Honolulu became the capital of Hawaii in 1900. 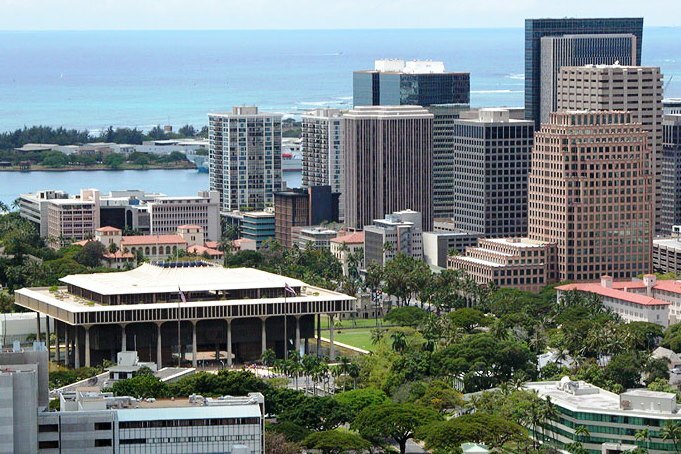 Honolulu remained the capital upon the state’s admission to the Union in 1959. The Iolani Palace was the seat of government from 1893 to 1969. This handsome Victorian building had been the home of Hawaii’s royal family; the statue in front is of Kamehameha III, the king who united the peoples of the islands nearly 150 years ago. The State Seal is displayed over the entrance to the new capitol, which is built of concrete and steel. Dedicated in 1969, the building rises behind an 80,000 square foot reflecting pool. Pearl Harbor naval base was attacked by the Japanese on December 7, 1941; visitors may see the USS Arizona Memorial. Diamond Head, a collapsed crater, is a well-known landmark beyond Waikiki Beach. The wildness of diversity, the lushness of the mountainsides, the beauty of the sea and sky. The wind, the fierce defending of the past, the changing to the new. Palaces and palm trees. Mountains near: Waianae Range. The highest point on the island of Oahu is Mt Kaala at 4,003 feet. Mauna Kea on the big island of Hawaii is the highest point in the state of Hawaii at 13,803 feet.